The Spanish government’s plan to have an observer present in the talks between parties over the Catalan crisis has been heavily criticised by some opposition parties. The Ciudadanos (Cs) party has called the move a ‘humiliation’ and a ‘disgrace’ for Spain. ‘We don’t accept that those who have carried out a coup should set conditions on those who respect the rule of law,’ said the party head, Albert Rivera. His party asked on Wednesday for Spain’s Prime Minster Pedro Sánchez to appear before Congress to give an explanation, because he has ‘sold the national sovereignty’. For the Ciudadanos party leader in Catalonia, Inés Arrimadas, Madrid accepting an observer shows the ‘desperation’ of Pedro Sánchez to remain in power. On Tuesday, the Catalan executive proposed naming a ‘neutral’ person to oversee the talks in exchange for considering support of Spain’s 2019 budget. The votes of the ruling pro-independence parties are necessary for the spending plan to pass in Madrid. Yet on Tuesday evening, they said more steps are needed in order for them to back the budget. For the People’s Party (PP) leader, Pablo Casado, Sánchez is committing ‘high treason’ by accepting an observer. ‘His surrender to the independence movement is the most serious felony since the 23 February 1981 [attempted coup d’état],’ he said. 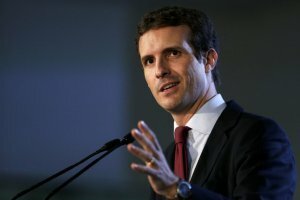 In a tweet on Wednesday, Casado did not rule out putting forward a motion of no confidence against the Socialists. Even some regional Socialist party leaders criticised Sánchez for accepting an observer. ‘Passing a budget does not justify concessions that cast doubt on the Spanish constitution and unity, the rule of law and decency,’ said Aragon’s president. However, the left-wing Podemos party greenlighted an observer as a tool to ‘build bridges and facilitate dialogue’. ‘I do not think that an observer or a mediator at a negotiating table will put democracy at risk,’ said Podemos spokesperson in Congress, Irene Montero.